Beadalon 7 Strand Bead Stringing Wire is made up of seven strands of stainless steel wire with a thin, smooth, kink-resistant nylon coating. 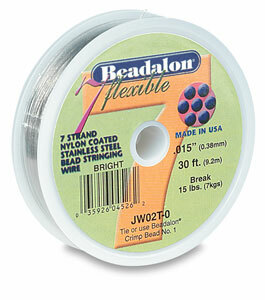 It's a strong, soft, and flexible wire, making it a favorite of professional jewelry designers. Available in two diameters and various colors. Made in the USA.